Obstructive sleep apnea (OSA) is a problem in which your breathing pauses during sleep. This occurs because of narrowed or blocked airways. When you sleep, all of the muscles in your body become more relaxed. This includes the muscles that help keep your throat open so air can flow into your lungs. Normally, your throat remains open enough during sleep to let air pass by. Some people have a narrow throat. When the muscles in their upper throat relax during sleep, the tissues close in and block the airway. This stop in breathing is called apnea. Loud snoring is a telltale symptom of OSA. Snoring is caused by air squeezing through the narrowed or blocked airway. Not everyone who snores has sleep apnea though. Sleeping on your back can also cause your airway to become blocked or narrowed. Central sleep apnea is another sleep disorder during which breathing can stop. It occurs when the brain temporarily stops sending signals to the muscles that control breathing. Central sleep apnea is a sleep disorder in which breathing stops over and over during sleep. If you have OSA, you usually begin snoring heavily soon after falling asleep. The snoring often becomes very loud. Snoring is interrupted by a long silent period while your breathing stops. The silence is followed by a loud snort and gasp, as you attempt to breathe. This pattern repeats throughout the night. Most people with OSA do not know their breathing starts and stops during the night. Usually, a sleep partner or other family members hear the loud snoring, gasping, and snorting. Snoring can be loud enough to hear through walls. Sometimes, people with OSA wake up gasping for air. Your health care provider will take your medical history and do a physical exam. Your provider will check your mouth, neck, and throat. You may be asked about daytime sleepiness, how well you sleep, and bedtime habits. You will need to have a sleep study to confirm OSA. This testing can be done in your home or in a sleep lab. Treatment helps keep your airway open while you sleep so your breathing does not stop. Avoid alcohol or medicines that make you sleepy before bedtime. They can make symptoms worse. Continuous positive airway pressure (CPAP) devices work best to treat obstructive sleep apnea in most people. You wear a mask over your nose or over your nose and mouth while you sleep. The mask is connected by a hose to a small machine that sits at the side of your bed. The machine pumps air under pressure through the hose and mask and into your airway while you sleep. This helps keep your airway open. It can take some time to get used to sleeping with CPAP therapy. Good follow-up and support from a sleep center can help you overcome any problems using CPAP. Dental devices may help some people. You wear them in your mouth while you sleep to keep your jaw forward and the airway open. Other treatments may be available, but there is less evidence that they work. It is best to talk with a doctor who specializes in sleep problems before trying them. Remove extra tissue at the back of the throat. Correct problems with the structures in the face. Create an opening in the windpipe to bypass the blocked airway if there are physical problems. Remove the tonsils and adenoids. Surgery may not completely cure obstructive sleep apnea and may have long-term side effects. In most cases, treatment completely relieves symptoms and problems from sleep apnea. Greenberg H, Lakticova V, Scharf SM. Obstructive sleep apnea: clinical features, evaluation, and principles of management. In: Kryger M, Roth T, Dement WC, eds. Principles and Practice of Sleep Medicine. 6th ed. Philadelphia, PA: Elsevier; 2017:chap 114. Kapur VK, Auckley DH, Chowdhuri S, et al. Clinical practice guideline for diagnostic testing for adult obstructive sleep apnea: an American Academy of Sleep Medicine clinical practice guideline. J Clin Sleep Med. 2017;13(3):479-504. PMID 28162150 www.ncbi.nlm.nih.gov/pubmed/28162150. Kimoff RJ. Obstructive sleep apnea. In: Broaddus VC, Mason RJ, Ernst JD, et al, eds. Murray and Nadel's Textbook of Respiratory Medicine. 6th ed. Philadelphia, PA: Elsevier Saunders; 2016:chap 88. Somers VK. Sleep apnea and cardiovascular disease. In: Mann DL, Zipes DP, Libby P, Bonow RO, Braunwald E, eds. Braunwald's Heart Disease: A Textbook of Cardiovascular Medicine. 10th ed. Philadelphia, PA: Elsevier Saunders; 2015:chap 75. 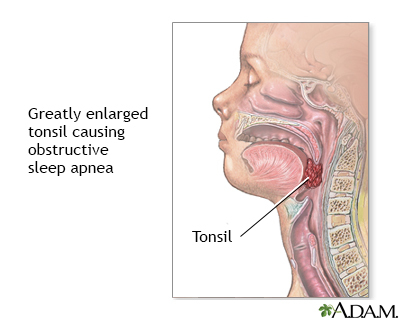 Massively enlarged tonsils can cause episodes of cessation of breathing known as obstructive sleep apnea. Cessation of breathing can last 10 seconds or longer, causing extremely low levels of oxygen in the blood. Reviewed By: Allen J. Blaivas, DO, Division of Pulmonary, Critical Care, and Sleep Medicine, VA New Jersey Health Care System, Clinical Assistant Professor, Rutger's New Jersey Medical School, East Orange, NJ. Review provided by VeriMed Healthcare Network. Also reviewed by David Zieve, MD, MHA, Medical Director, Brenda Conaway, Editorial Director, and the A.D.A.M. Editorial team.